All On Focus: In the middle of diffculty, lies opportunity. Here's what i got Amelene for her 18th birthday, i thought it looked really exquisite and elegant. first time I ever used such words to describe my handmade cards. 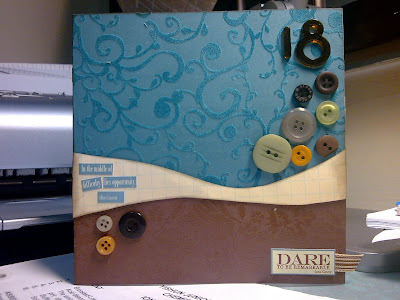 Maybe its the way i see it, because this is a really REALLY long time since i have done scrapbooking and card making. Trust me, it looks harder to come up with such a simple idea when you are eons ago making photos on paper. This card really made me quite happy... as all scrapbookers say, its the process. Sigh, back to life: in all ways to resist the urge to scrap and blog and study, its so focus and enjoy in these tiring times. Finally, stupid prelims its over and its time to focus on the real WAR. Meanwhile, I am gaining so much weight.